The dive site Geldkis is an inshore rocky reef in the North Oudekraal area on the Atlantic seaboard of the Cape Peninsula, near Cape Town in the Western Cape province of South Africa. 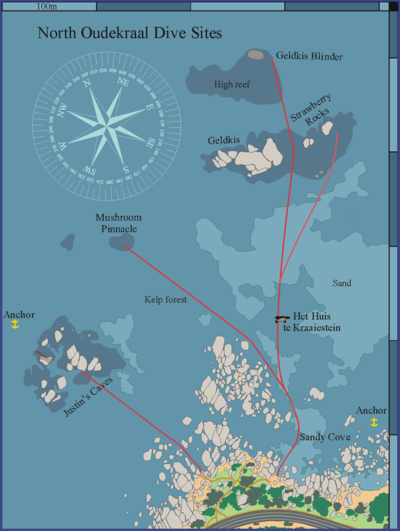 Map showing the location of the dive site Geldkis at North Oudekraal. The site has rugged topography, with walls, swinthroughs, gullies, overhangs and chimneys and varied and colourful sea life, and is spectacular in good visibility. There is a small group of Cape fur seals resident in the area, which often visit divers. Geldkis is a large group of huge granite boulders and outcrops which extends above water about 5m and down to sand bottom on the seaward and landward sides. There are numerous lower submerged boulders around the exposed ones, Inshore they tend to reach up to about 4 to 6m depth on top, but seaward they tend to be somewhat deeper and flatter in profile. Many of the boulders are arranged such that there are overhangs, swim-throughs and caves under them. There are also some which are a bit loose and may be moved by wave action so they bang against each other, making for a noisy dive in places. This is more noticeable on the seaward side of the eastern end. There is a big cave on seaward side under a few huge rocks with several entrances and chimneys This is probably about half way along the length of the exposed rocks. There is a big fairly low headroom overhang/cave just east of the gap at Strawberry Rocks and there are also some deep narrow gaps between rocks. Surge can be strong. The site is spectacular in good visibility. 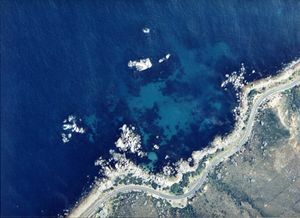 Bottom is sand between the rock group and shore, with occasional rocks closer inshore, and scattered boulders near the group, often with tall clumps of kelp. Overall length of the Geldkis group is about 175m (including Strawberry Rocks) and it is about 50m wide in places. Wider and longer if you count low flat outcrops. The site is often at it's best during or after south easterly winds, but strong south easterly winds (offshore) can make it difficult to swim back to shore at the surface. It is exposed to south westerly swells, and surge can be strong, particularly in the swimthroughs. This is an area which sometimes has upwellings, caused by south easterly winds, resulting inclear cold water, which may develop an algal bloom after a few days, which will reduce the visibility. No facilities provided. Security is dubious as with parking at the side of all public roads. Shore dive. Parking is at the side of the road on the outside of the bend on the City side of the Twelve Apostles Hotel. The path starts near the signpost and after a steep descent curves round to the north between some trees and a granite boulder. It continues north-eastwards and then splits in several directions. The first branch is to the left to the entry for Justin’s Caves, The second continues more or less straight down a slope to a shallow gully between big boulders. There is an old piece of rail and small boulders in this north west entry point. The third branch is to the right, uphill slightly and through between some bushes, then down over the rocks to a shallow sandy gully, with a small beach at low tide. This south-east (closer to the road) entry point has a sand bottom with large granite boulders on both sides. The boulder on the right is convenient resting place for fins, camera etc when making final preparations for entry. The access at both these points is very protected and safe in almost any conditions you would consider diving. There is quite a long swim to get to the dive site, and the return swim may be very tiring if the south easterly wind comes up. Boat dive The site may be done as a boat dive, either from Oceana Power Boat Club in Granger Bay, which is slightly closer, or from Hout Bay. Boats may anchor on the sand inshore of the rock. Kelp forests on the tops of the shallower rocks. Walls exposed to the south west and north west swells are relatively bare compared to overhangs, caves and sheltered areas, some of which are very colourful and heavily encrusted with sponges and small sea fans. More exposed areas have a lot of red bait and black mussel, and the low reef on the windward side is granite boulders covered with pink corallines and huge numbers of sea urchins. Also some limpets, red stars, whelks, small orange sponges and grey cucumbers. Huge variety of organisms in caves including knob ascidians, lobed ascidians, white ball sponges, noble corals and sea fans. Big swimthroughs, crevices and chimney. A good site for macro photography, though wide angle is useful if the visibility is good. Two routes are suggested for shore dives. Concentrate on the seaward side of the group, as there is more to see there. Entry at Sandy Cove beach, swim out on surface to just inshore of the south west end of the Geldkis rocks. Dive round the rocks in a clockwise direction, going through swim-throughs, and amongst the boulders. Return to Sandy Cove on compass course from the Strawberry Rocks gap, or if air supply and temperature permit, continue the dive to Strawberry Rocks and return from the north east end of the group. Exit at same point as entry. Entry at Sandy Cove beach, swim out on surface to gap at Strawberry Rock end. Dive through swim-throughs and around to seaward side and into the big cave/swim-through under the rocks, then out and round the south west end and back to Sandy Cove along the northern edge of the point. Cold water, Hot sunshine. Strong surge in the gullies and swim-throughs. Sea urchins. Strong offshore winds may develop over a short time. No special skills are required. For a shore dive a fair level of fitness is required as there is a long swim to and from the site (about 300m each way). Ability to navigate back by compass is recommended, particularly if there is offshore wind forecast. This page was last edited on 10 April 2013, at 05:44.